How do clothes constitute an environmental problem? It is mainly the manufacturing of clothes and other textiles that has an adverse impact on both humans and the environment. Most often, outdated and seriously harmful pesticides are used in the cotton fields, affecting both the nature in the area and the people working in or near the fields. But the most significant environmental impact comes from post-treatment processes, like spinning, knitting and, above all, dyeing – the wet preparation. Because of all the chemicals used, the wet preparation is just as harmful as cotton cultivation. Large quantities of water and energy are required for the manufacturing of clothes, and the environmental impact is further increased by the amount of discarded garments. In Sweden, we buy on average 15–20 kilos of textile per year, and we throw away 8 kilos. That is not sustainable. In what way does Cottover contribute to sustainability? Cottover was created to try to address the social and environmental challenges throughout the manufacturing chain – from raw material to end product. The cotton comes from an organic farmer that does not use chemical pesticides and who is paid fairly in accordance with the Fairtrade criteria. We have minimised the use of chemicals in the entire manufacturing chain, and in accordance with the criteria laid down by The Nordic Swan Ecolabel, only certain approved dyes and chemicals are allowed in the post-treatment processes. All our suppliers must adhere to the UN conventions on working conditions, and we have complete traceability, from cotton to garment, which is highly unusual in today’s textile industry. In addition, our clothes are tested to ensure good quality. By making good-quality products we can reduce the unnecessary waste of natural resources and the clothes that end up in the trash after a few uses. But most of all, we contribute through our customers. It is not until a customer chooses a sustainable product that our work really has an impact, because at that point we can compete with conventional products and support the suppliers who produce sustainable clothes and textiles. The demands of the costumers determine what supply will be available. If you buy organic clothing and actively choose clothes that are manufactured with consideration for both humans and the environment, it increases the demand for sustainable products on the market, which gives us a more sustainable textile industry in the long run. Why are eco-labelled clothes more expensive than “regular” clothes? To compare prices fairly you have to ask yourself if the clothes are of the same quality. Consider the materials used and the way the garment is sewn. Look at the hems and seams. How does the fabric feel to the touch? If your garment fades or changes colour or shape within a month, you have hardly got the best value for your money. If you do not take garment quality into account, you might as well compare apples and oranges. Eco-labelled clothes often have a higher manufacturing cost. It is quite natural, really. For example, Fairtrade cotton means that the cotton farmer is guaranteed payment that covers the costs of sustainable production and a bonus to be used for investing in the local community. The Nordic Swan Ecolabel and GOTS make great demands on all suppliers in the chain, for example regarding working conditions, environmentally-friendly processes and the kinds of chemicals used, which may lead to higher costs for the suppliers. These costs need to be covered by the customer buying the product. And using eco-labels on the garments is not free. The Nordic Swan Ecolabel, Fairtrade and GOTS are non-profit organisations, meaning that companies like ours pay fees and licences to use their services and brands. Considering Cottover’s high quality products, our prices are very fair. Thanks to large volumes and large-scale production, our products are only marginally more expensive than conventional products. Our prices are among the most competitive on the market for sustainable and eco-labelled clothing. Why are Cottover clothes manufactured in Bangladesh? Wouldn’t it be easier to guarantee a sustainable and fair production if the clothes were manufactured in Europe? The most significant sustainability challenges are global. In order to achieve any improvements we need to start changing the world where it will have the greatest impact, where the challenges are found. Bangladesh is one of the largest exporters of clothes and textiles in the world. To create a more sustainable textile industry we have to focus on the countries where the manufacturing actually takes place. Cottover strengthens the market position for suppliers that have invested in environmentally-friendly methods and better working conditions in Bangladesh. This also creates an incentive for other suppliers to follow their lead. Bangladesh is a country which is deeply dependant on its textile industry. The industry makes up about 80% of the country’s export earnings and employs about 4 million people. With a continuously favourable development on the global market, the industry could employ another 15 million people in 20 years. If this prognosis is correct, Bangladesh could be classified as a middle-income country in 2021 – an extremely important objective in the fight against poverty. Sustainable consumption – is there such a thing? Since consumption is a prerequisite for trade, it is essentially a positive thing. It is necessary for our economy, for job creation and for welfare. Nearly all of the decrease in extreme poverty has come about in countries integrated with the rest of the world through trade and an influx of international businesses. And almost all countries that have gone from poverty to industrialisation in modern times have done so with the help of the textile industry. The UN Development Programme (UNDP) states that the textile and clothing industry is unique in the global economy, due to its ability to help countries develop. At the same time, trade must be fair and sustainable to lead to a positive development. This is where customers and consumers come in. We have the option of voting for sustainable products and responsible businesses through our wallets. With our purchasing power we can make positive changes. In other words, conscious consumption leads to sustainable development. Why are third party certifications important? For the average consumer, knowing what we are buying and how a product is manufactured is not an easy task. Even for suppliers it can be difficult to know all the steps in the supply chain, since the chain is usually made up of many different links. With third party certification and labelling, both manufacturers and consumers get reliable guidance. – Complete traceability from textile fibre to garment. All links in the supply chain are documented! – Reviewing and verification – by an independent organisation – to ensure compliance with the requirements. – Yearly visits and inspections to ensure the suppliers comply with the requirements. – Labels that are well-known on the market and help customers find sustainable products without hassle. 1. No chemicals/pesticides! Any insecticides and herbicides used must be distributed manually. 3. No genetically modified (GMO) crops. Apart from the obvious environmental benefits from organic cotton, there are other benefits as well. Cotton that is cultivated naturally and without the stress from fertilisers has a higher quality, with long, even and soft fibres. Clothing made from organic cotton means that the cotton used in the garments is organic, but the garments themselves may have been bleached, dyed or otherwise treated like conventionally manufactured clothes. So, while organic cotton is good, eco-labelled clothing is the best! Why? Because environmental requirements apply all the way from the raw materials, for example cotton, to the end product. 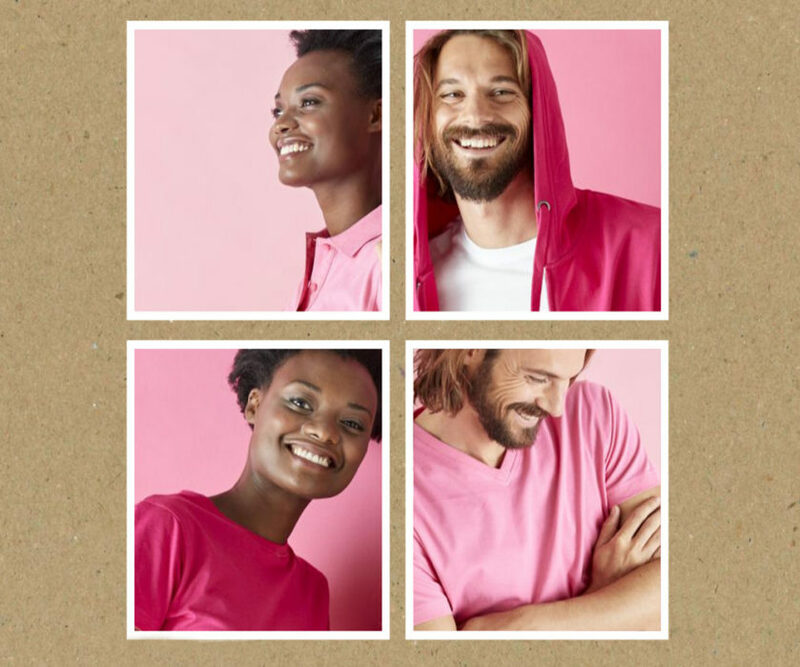 Why is Fairtrade certified cotton important? Cotton is sometimes called The White Gold. It is a source of income for about 100 million households in over 70 different countries. But being a cotton farmer is not always easy. The competition on the global market is extremely tough, and the price of cotton has dropped significantly in the recent decades. This means severe difficulties for cotton farmers in developing countries, as they do not have the resources to compete with heavily subsidised cotton from wealthier countries, such as the USA. Fairtrade establishes criteria to guarantee that the farmer gets paid a minimum price covering the cost of sustainable production. The farmer also gets a bonus to be used for development in the local community, for example building a new school. Fairtrade is a security for farmers whose margins are already small. Each time you choose products made by Fairtrade certified cotton you help these farmers improve their working and living conditions. 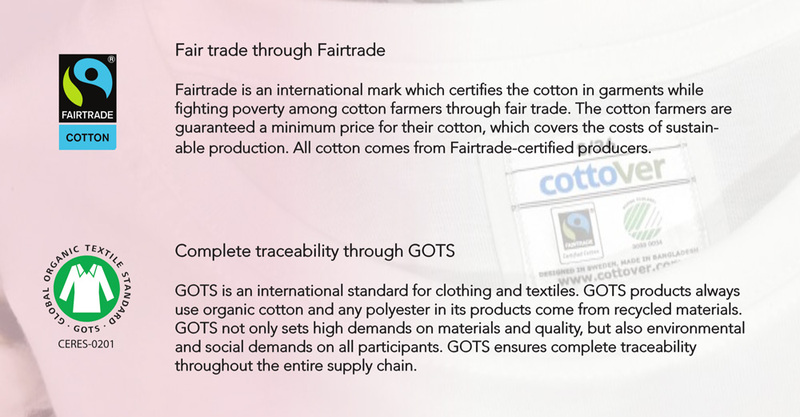 cottoVer® only uses Fairtrade certified cotton! How is the cotton production controlled? Can the labelling be trusted? For Fairtrade to certify cotton, each supplier in the supply chain must be certified by Flocert (an independent certification body). These inspections are repeated yearly, in order for the suppliers to keep their accreditation. In addition, every time the cotton or material is transported through the supply chain, a special traceability certificate called a Transaction Certificate is issued. That way, the certification body can control the flow of organic cotton, i.e. the amounts coming in to and is sent off by the supplier. And the numbers must add up. Our company, tg-h AB, has also been subject to inspections aimed at tracing our cotton flow, all the way to our warehouse and to the customer.